I have very fond memories of the cursive letter banner that was posted around the top of the walls in my fifth grade classroom. 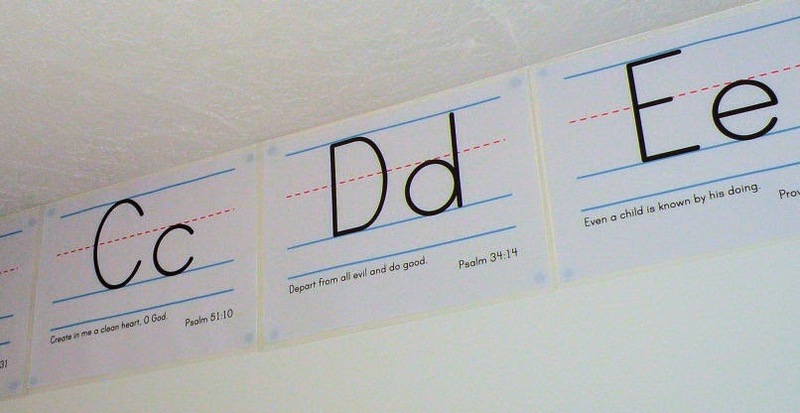 I thought it would be fun to make something similar for our homeschool classroom (a.k.a. our kitchen). 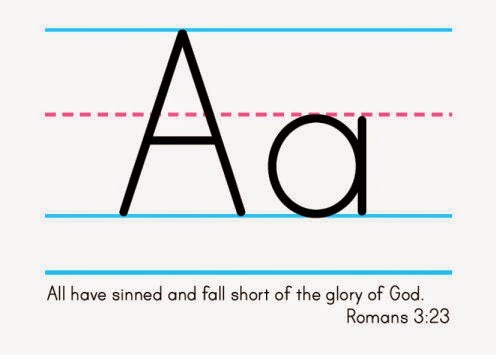 I decided to include a Bible verse for each letter. At this point it's mostly for my own benefit since Miss M doesn't read yet. They serve as great reminders to help her memorize these important bits of Scripture while her little mind is still a sponge. (It saddens me that my memorization skills are not what they were when I was a kid!) The fun part is I saved my work in a pdf file for you to use too! Just click the image above to download the file. I laminated mine before sticking them around my kitchen walls with ticky tacky. (The laminator is a new toy!) Enjoy! Wow! This is really great! It feels almost wrong to just print these out because of all the work you put into them, especially finding a good bible text to go with each one. Thank you so much. I love having them up in my kitchen! (And so does Miss M.) I'm glad you can find a use for them! I can't print these as I cant open a link from the photo. Are you able to help me? The link was broken when I moved over from Wordpress. It has now been repaired! So sorry for the frustration.